The world leaders pursuing for endless economic growth? If we wish happiness for the following generation, the collapse of the Earth’s Life Environment should be the biggest issue. Scientists are extremely concerned about these issues, but the actions by the world leaders are so slow. Furthermore, ordinary people seems to think that the problems would be managed somehow, by leaving these issues to their government. 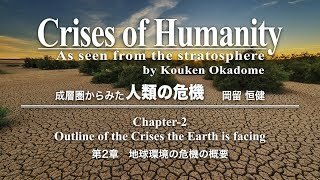 I compiled an overview of those problems as [Crises of Humanity]. 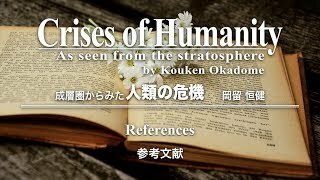 And as an appendix, I released English narration on YouTube with English / Japanese subtitles. They consist of 15 videos, which would be helpful for those people who are unable to read letters physically or because of educational reasons. 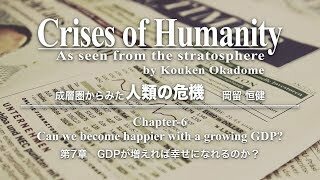 Chapter-6 Can we become happier with a growing GDP? 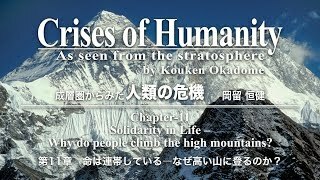 Chapter-11 Solidarity in life – Why do people climb the high mountains? As seen from the stratosphere since 1960s. but in the inflating residual pollution by mass consumption. In 1980, economic growth exceeded the limit of the earth. and the Earth’s ice began to melt tangibly. 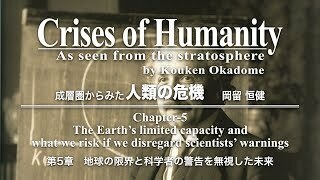 These are the evidences which prove that the Earth has limitation. An Airline Captain’s messages written with sense of crises for the Earth’s environmental issues that has been witnessed from the stratosphere since 1960s. These are the sincere prayer for happiness for the succeeding generations. If the Nobel Prize has any academic authority, the contents of this warning, submitted only a few months after the Rio Summit, must contain serious scientific evidence. However, this warning was virtually ignored. It is 2017 and 25 years have passed since then. Irreversible deadline of the scientists’ warning had probably gone by now. According to the scientific index “Ecological Footprint”, excessive mass consumption has surpassed the Earth’s capacity around 1980, and thereafter the portion of the consumption that has exceeded the Earth’s limitations could not be purified and accumulated as residual pollution. Global warming is one of the phenomena of residual pollution caused by carbon dioxide. As a result, the Earth’s ice began to melt tangibly and the sea level is rising. At around the same time, a number of living species started to disappear drastically. If the current speed of extinction continues, all living creatures would disappear in 3 centuries. Should human beings keep aspiring to the current 3% of economic growth, the consumption and residual pollution would double every 23 years. However the one-and-only Earth cannot physically support this consumption. The more the economy grows, the more residual pollution increase exponentially, and those costs for residual pollution curtail other really necessary budgets including welfare and social structure. Considering these facts, the world economy and social structures would be thrown into confusion within 2 decades at the most. But the world leaders are still pursuing economic growth. At 2013, Global Warning Conference (IPCC), stating that the air temperature would rise almost 5℃ by the end of the century. In the Earth’s history, this situation is identical to that of 35 million years ago, when there was no ice on the Earth, carbon dioxide density was as high as approx. 450ppm and the sea level was higher than the current level by more than 70 meters. In 1980, the density of carbon dioxide in the atmosphere exceeded 340ppm, which is considered to be the upper limit for the existence of the Ice in the northern hemisphere, and then the Ice actually started melting away. Furthermore, in 2015, the density of carbon dioxide has surpassed 400ppm and keeps increasing 2ppm per year, which will reach 450ppm by 2040 – only 23 years from now. In other words, we, mankind, are turning the clock back to the age when there was no Ice on the Earth and the sea level was more than 70 meters higher. Then, why has such a crisis of humanity occurred? The gap between the rich and the poor is the root of all the evil might be the answer. 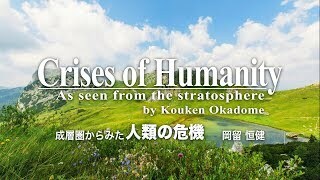 The society allowing freedom of human greed has induced the destruction of the Earth’s environment and the gap among people generating envy and hostility in peoples’ minds, thus the world conflicts would occur. These destruction and the gap or world peace are all interlocked as contemporary social issues. If the young people keep on being indifferent to politics and let the older generation run the country, the young people will end up living as the working poor under an unbearable living environment degraded by residual contamination. There is a simple principle about possession of goods and happiness. If there is no difference between the rich and the poor among us, the desire to have more things than others will be diminished, and we could be in peace in soul and be kind to the others too. Those society could be realized by young generation taking advantage of the system of democracy, in which each person has one vote. It is not just a far-off dream for young people to return to the peaceful and beautiful world. Hope is in the change to hyper-progressive tax system to resolve the gap society. If the gap disappears human desires will also be diminished, and we could return to a roadmap that will stay within the limits of the earth’s capacity. Complicated policies and mental theories are not necessary. Just change the tax system and the flow of money will change, which in turn will induce a change in the way of life and the view of the world. I want young people to think seriously about their futures so that they can spend peaceful and happy days. Upraise working poor! to the generations to come. 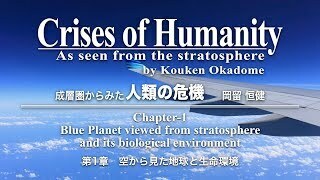 The full text of this document is provided in the following PDF file both English / Japanese. I hope these narrative videos would be helpful for those who are unable to read letters physically or because of educational reasons. You can play the YouTube videos by clicking the title of each chapters or contents. I have compressed the outline of the issue in the first video. 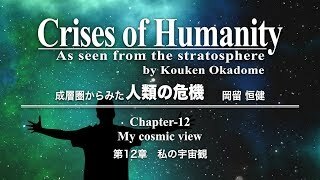 I will be very happy if you read even the first video only. From Japan’s surrender to the entrance of the material world. Earth viewed from the sky that I adored. Crisis: Extermination of Living Species. 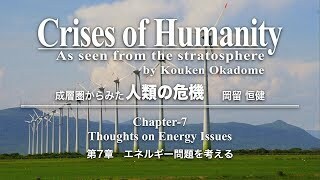 Crisis: Earth’s Purification Capacity and Residual Pollution – Energy Shortage is not a Crisis. When will we face the real crisis? Global Warming Conferences’ Actions and Numerical Predictions. Global warming and sea level increase from the perspective of the density of carbon dioxide and air temperature. The threshold of the existence of the Ice will be surpassed in 25 years – Targeted figures of global warming conferences. Density of Carbon Dioxide, Air Temperature, Sea Level and the history of The Ice. The Ice thaw – current status. Damages caused by Global Warming. 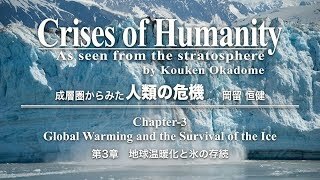 Global warming and the drift of continents – Saga of Earth and human beings’ influence. Human bonds: Unprecedented heavy snow. 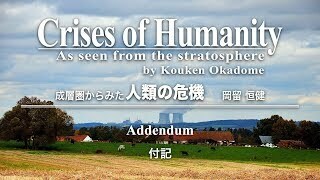 Earth and the fate of human beings. Our biosphere is already in a new phase of extinction. 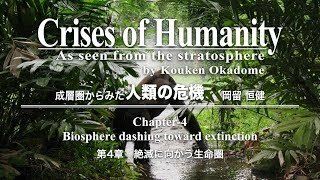 Manmade causes of the extinction of living species – Reason for human existence. Scientists’ warning and mass consumption bred by the freedom to be greedy. Ecological footprint – Index that represents the Earth’s limitations. Double-your-money economic growth and the future of consumption. Can we become happier with a growing GDP? Current status of economic accounting that fails to take into account the Earth’s physical limitations. The ever-expanding contemporary economic structure – Impact on the living environment. New Energy Development – What is Clean Energy? Fundamental energy for life – Cyclic wheels, Mother Nature’s blessing. Trends in Earth’s environmental issues –The impact of consumption on the Earth. 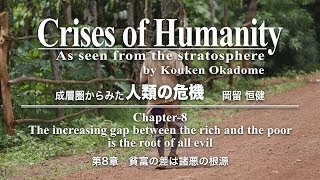 The increasing gap between the rich and the poor causes all the evil. The gap between the rich and the poor, and the global environment–Can the developed countries be a model for the developing countries? The principle of material ownership and happiness. My feelings for the gap between the rich and the poor – One cannot choose to be born. Movement of goods and the disruption of circulation. Locally consumed local production increases circulation–a small society is ideal. Why imported goods are cheaper. 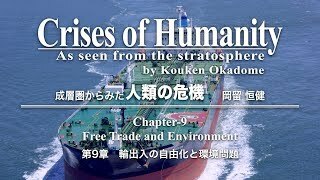 The conflict over water between the rural and industrialized urban area–the urbanization of the world and food import in Japan. Japan is rich in the resources of life–rice paddy cultivation is the wisdom of circulation. Eliminating the gap between the rich and the poor. The way to reduce consumption to within the limits of the Earth’s capacity－Regressive Circulation Tax. 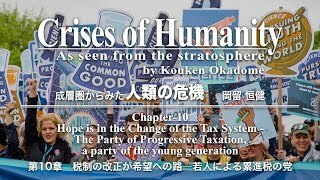 Hopes for the Establishment of a Progressive Tax Party. Fairness in money circulation in society. A tax system that shares, and doesn’t compete—the joy of sharing. Why do people climb the high mountains? Solidarity in life might be the answer. The instinct of solidarity, forgiveness, and love –between the old brain and the new brain. Anything good for life looks beautiful－the happiness of life is to be found within the circulation. Food is life – Study of food education. Learning about life during childhood – solidarity of life and the continuation of life. The story of the solidarity of life－from the first life to my life. The circulating macro cosmos – Life and the swirl of the universe. The starlit sky and the light of the house. The size of the universe–My sense. Daydreams about what comes after death.